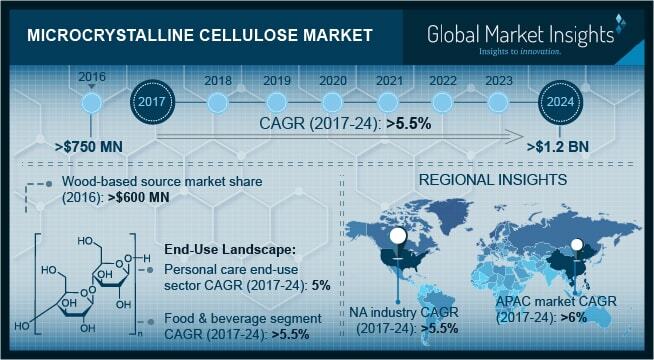 Microcrystalline Cellulose Market size is forecast to exceed USD 1.2 billion by 2024; according to a new research report by Global Market Insights, Inc.
Strong growth indicators in the pharmaceutical industry mainly in the U.S. is probable to make noteworthy contribution to the overall microcrystalline cellulose market size by 2024. Product is widely used as an excipient in the drug formulation and is an essential component, owing to its excellent compressibility properties which makes it preferable for almost every kind of oral dosage including tablets, capsules, sachets and pellets. Additionally, rising R&D investment in the pharmaceutical industry in the U.S. will further drive product demand, which will make substantial contribution to the overall microcrystalline cellulose market size by 2024. According to International Federation of Pharmaceutical Manufacturers & Associations (IFPMA), the total R&D investment in the pharmaceutical industry in the U.S. was valued over USD 60 billion in 2016, which is projected to further rise, owing to persistent need to make technological advancements. High cost of production along with several product alternatives available in the market are probable to hamper the MCC market by 2024. For example, guar gum and carboxymethylcellulose (CMC) are among the cost-effective product substitutes, while xanthan gum and pectin act as major threats, owing to its increasing food applications. However, MCC production using environmental friendly raw material sources will generate ample opportunities for microcrystalline cellulose market size by 2024. Based on non-wood sources, MCC market share is projected to rise at a CAGR more than 6% by 2024. Non-wood sources include reed stalks, wheat and rice straws, jute, sugarcane bagasse, coconut shells, soya bean husk, groundnut husk and various other sources. Product introduced from the aforementioned sources are at par, in terms of the physical and spectroscopic properties with the product obtained from wood-based sources. Additionally, persistent need to lessen deforestation has resulted in encouraging MCC production via non-wood sources which will have substantial impact on the MCC market size by 2024. The microcrystalline cellulose market share for food & beverage industry is projected to witness growth of more than 5.5% by 2024. It is due to extensive product applications in the preparation of different types of food items. It is a preferred hot and cold stabilizer in food items including ice cream, frozen food, canned meat, and condiment to improve their stability. Additionally, it is also used as an anti-caking agent in baking goods to improve water retention and reduce food calories. Product may also be co-processed with carboxymethyl cellulose (CMC) to impart shear-thinning and heat stable properties. These co-processed products manufactured possess additional properties such as gelling, increased viscosity, and suspending. Rising health awareness across the world is expected to drive product demand across food industry which will make subsequent impact on MCC market size by 2024. North America constituted a major chunk of the global MCC market size and will witness gains of more than 5.5% by 2024. It is primarily due to product application across several end-user industries including food, pharmaceutical, personal care and paints & coatings industry. North America dominated the sales statistics of the pharmaceutical industry which constituted 39% of the global pharmaceutical sales in 2016, which is likely to make substantial contribution to MCC market size by 2024. Furthermore, rising demand for fat-free food stuff in the North America will further make prominent contribution to MCC market size by 2024. Microcrystalline cellulose market share is highly consolidated as major manufacturers constituted more than half the overall business size in 2016. The prominent MCC market manufacturers are Asahi Kasei, Mingtai Chemical BLANVER FARMOQUIMICA and FMC Corporation. The major players are engaged in increasing their product portfolio by signing agreement with other players. For instance, Mingtai Chemical Co., Ltd. announced the extension of its agreement with DuPont Nutrition & Health (Danisco) in 2013 for the manufacturing of product colloidal grade microcrystalline cellulose.